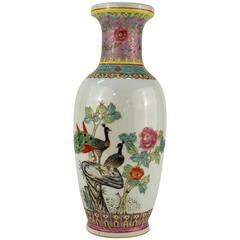 Fine painted porcelain vases with birds and flowers bloom decoration. The bottom of the porcelain is 10.5in/D. Fine painted porcelain vases with birds and flowers bloom decoration. The bottom of the porcelain is 7.5 in/D. Fine painted porcelain vases with flowers bloom decoration. 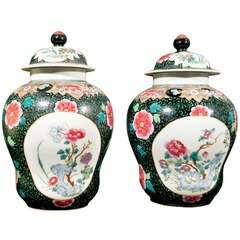 Fine painted porcelain vases with flowers bloom decoration. The bottom of the porcelain is 11.5in/D. Large pair of circa 1900 Famille rose decorated porcelain covered vases, each decorated with fence, large flowering trees, landscapes within cartouches and lids with fu dog finials. Chinese famille rose porcelain vase. Samson Porcelain vases and covers Late 19th century Exceptional size. ”Famille Rose” Decoration. One with invisible restoration in the body. A vase and cover, decorated with peonies &c in the Famille Rose style. Incised R mark group. Prov Taylor Collection; Simon Spero; Joseph Handley.